Key leaders of the peasant struggle in San Salvador Atenco, Mexico state, have been sentenced to 67 years 6 months in prison, in a vicious act of class revenge. 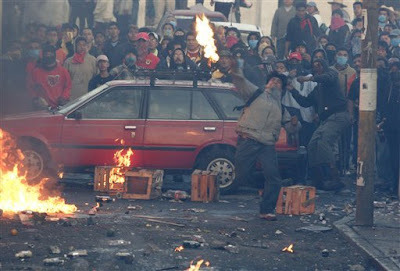 Atenco was stormed in May 2006 by thousands of Federal police, who killed two, raped dozens and injured many more. The conflict goes back to 2002 when the peasants of Atenco prevented the theft of their land to build a new Mexico City airport. In a vicious act of class reprisal Ignacio del Valle Medina, Felipe Alvarez Hernández y Héctor Galindo Gochicua, leaders of the Peoples Front for the Defense of the Land in Atenco, were sentenced on Saturday 5 May to 67 years 6 months jail each for the events in Atenco in early May 2006. In a timing which is undoubtedly cynical and symbolic, the court chose the first anniversary of a mass meeting in Atenco at which subcommandante Marcos denounced the brutalisation of Atenco’s citizens. That brutalisation started with clashes on Wednesday May 3 2006, when more than 200 people were arrested and two killed, as police brutally prevented flower sellers from Atenco setting up stalls on the building site which is to become a new Wal- Mart shopping mall. Rosario Ibarra de Piedra, chair of the Mexican Senate’s Human Rights Commission denounced the sentences as a “terrible vengence, which has the objective of silencing the demand of the people for liberty and justice”. Subcommandante Marcos of the EZLN led a protest convoy of 50 vehicles which immediately headed for the prison where the three are held, as soon as the sentences were known on Saturday. These vicious sentences come in the wake of the fraudulent election last summer when right-wing candidate Felipe Calderon was put into power, on the back of panic in the Mexican ruling class (and the US government) that the election of PRD candidate Manule Lopez Obrador might lead to Mexico linking up with Bolivia and Venezuela, opening a new front of left wing struggle in Latin America. It also comes in a climate of growing repression aimed at the popular movements – massive repression against the rebellion in Oaxaca in which dozens appear to have been killed, many are missing and many more are being held as political prisoners. The police and military are stepping up their repression of the Zapatistas’ Other Campaign. 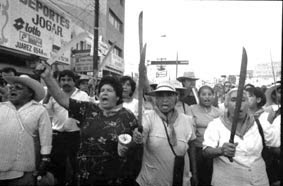 The provocation in San Salvador Atenco in May 2006 was directly linked to the participation of the town’s people in the Other Campaign and the visit of Marcos; in addition it was an attempt at revenge for the successful local struggle in 2002 that prevented the local peasants’ land being seized for a new Mexico City airport. 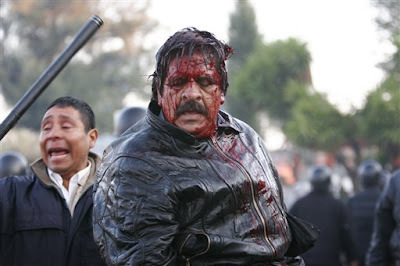 Repression in growing apace in Mexico. Under previous president Vicente Fox and now Felipe Calderon, both of the neoliberal PAN party, the number of political prisoners has gown to over 400. Deaths in social protests are becoming much more common too – the highest level since the military repression against the Party of the Poor in Guerrero state in the early 1970s. This is the consequence of the neoliberalisation of Mexico since the late 1980s. Social inequality is growing rapidly – Mexico now has some of the richest people in the world and many of the poorest, especially in the countryside. The Mexican bourgeoisie, dripping in narco super-profits and the profits from agribusiness and the maquiladora assembly plants, has responded with extreme violence to the explosion of social struggles.